Calling 911 sounds simple, but put yourself in the place of a child is being told to do this under an extremely stressful situation or the child of an unconscious parent that does not know what to do or say? ot so simple now is it? Teaching your child how and when to call 911 is an extremely important lesson for them and will make it more comfortable for them should the need arise. Teaching your child how to call 911 should start with a simple understanding of the phone and the three buttons. If you are referring to 911 around your children as nine eleven, please understand how this can confuse a smaller child that may look for an eleven button, so make clear to the child that it is three pushes of the buttons, 9-­‐1-­‐1. Next should come the lesson of where you live,the address and apartment number. It is surprising when doing fire demonstrations how many children do not know their address or phone number. These are things that will help the 911 operator thus speeding up the arrival of the responding units. Some areas of the country have expanded 911 which allows the operator to trace the call in case a disconnection happens. But knowing it by memory is the best answer. 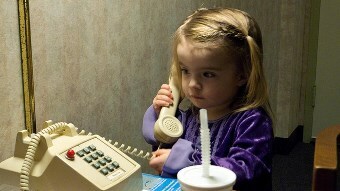 Children often feel they will be in trouble if they use the house phone or call 911. Teach your child to be honest with the 911 person and to calmly and clearly answer the questions they are being asked. For example, what is your address? Is the person awake? Is the person breathing? Defining what an emergency is and when to call 911 is the next step. Having your child understand that major things like fires, seriously injured people and intruders in your home are real emergencies and things like a missing toy or a flat bike tire are not. A test run should be in order when the child is ready. You can try an old phone or simply unplug your phone and have the child dial and answer the questions and see how well they do. Obviously the older the child the easier it will be and this may take more time with younger children but we have all seen the stories on the news of very your children calling 911 and saving a life. I hope and pray your child will never have to call 911 but always teach them that if there is ever any doubt that they should call. Better to be safe than sorry. Your New Baby Safely Met Your Dog … Now What?? ?